Payroll tax calendar of the day: Monthly deposits for June are due July 16th. Quarterly sales tax returns are due June 20th. 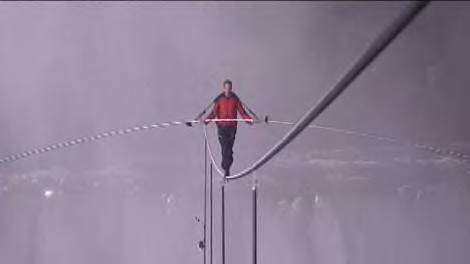 Hope everyone got the chance to watch Nik Wallenda’s history making walk across Niagara Falls on Friday. Tightrope walkers crossed the rapids back in the 1800’s, but this was the first time anyone has walked over the Falls itself. I was lucky enough to get one of vouchers for Terrapin Point, and selected a viewing spot adjacent to the wire just past the start. Nik walked right past this area as he walked over the rapids above the Falls. If you thought the walk looked scary on TV, you should have seen it in person; the mist was very heavy. Every time Nik safely passed one of pendulums (which were hanging from the wire to keep it from rolling), the crowd cheered. Then about 2/3 of the way across, Nik totally disappeared into the mist. We had no way of knowing what was happening unless we heard cheering from Canada as he passed the rest of the pendulums. Then we heard cheering from Canada followed by a signal on our side and the lowering of the starting platform. We knew Nik had successfully made it! This entry was posted in Payroll Taxes, The Old Payroll Tax Lady and tagged Niagara Falls, Nik Wallenda, payroll taxes, sales tax. Bookmark the permalink.